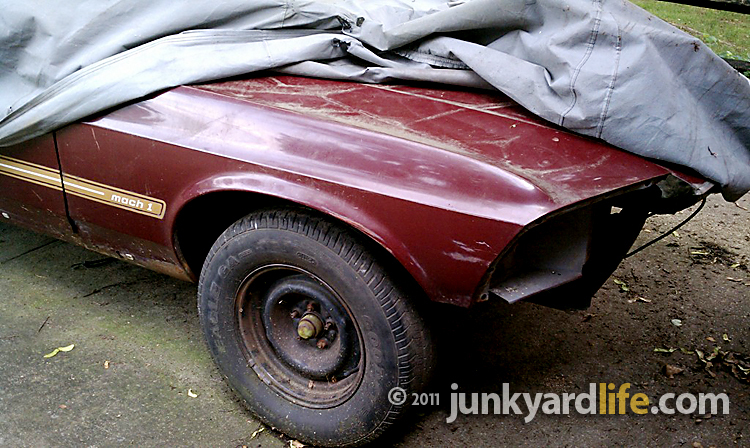 Uncovering a 1969 Ford Mustang Mach 1 project in New York. Cars painstakingly covered and parked in a driveway can be torture for swivel-head, automotive buffs on the prowl. "What's hiding under there? Could it be a classic? Is is for sale?" Mental notes of the mystery car's location are recalled on every routine outing. They circle their prey as often as possible in hopes of getting a glimpse of what lies under the car cover. Gary K. of Long Island, New York is one car buff whose relentless pursuit of classic muscle cars uncovered this Royal Maroon 1969 Mach 1. "I've seen this 1969 Mach 1 about a thousand times parked in a driveway near my hometown," said Gary. "I always knew it was an older Mustang." 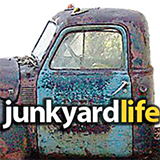 Recently, Gary finally gave in to the magnetic force that pulls gearheads and decaying classic cars together. The cover was about to come off. A 1969 Mustang Mach 1 has been teasing motorists from under a car cover in a Long Island, New York driveway for many years. 1969 was the first year for the Mach 1 and the SportsRoof option. "All original and not for sale"
Gary met an older gentleman at the door and asked him for the details on the old car in the driveway. Of course a closer look and a talk with the homeowner would lead to the inevitable question. "Is it for sale?" 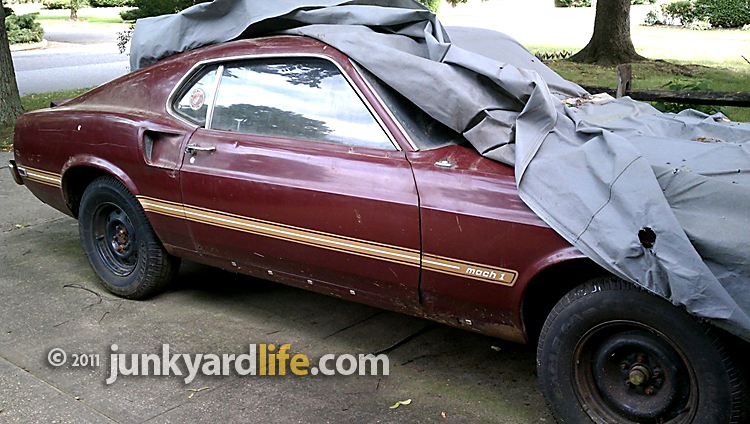 The Mach1, which has a rusty rear bumper, was missing the grille, headlights and front bumper, has been parked in the driveway for many years. "Of course it was 'not for sale,'" said Gary. "He let me peek under the cover anyway." 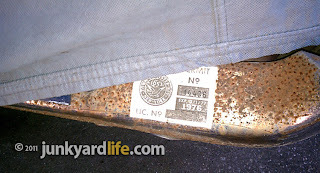 Vintage 1976 parking decal from the Town of Oyster Bay, New York. The engine and interior are not currently in the Mustang but the original paint, decals, and factory shaker hood remain on the car. 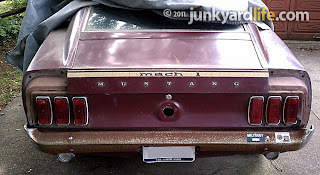 "The homeowner told me that the 1969 Mach 1 belonged to his son and he was is in the process of restoring it," said Gary. 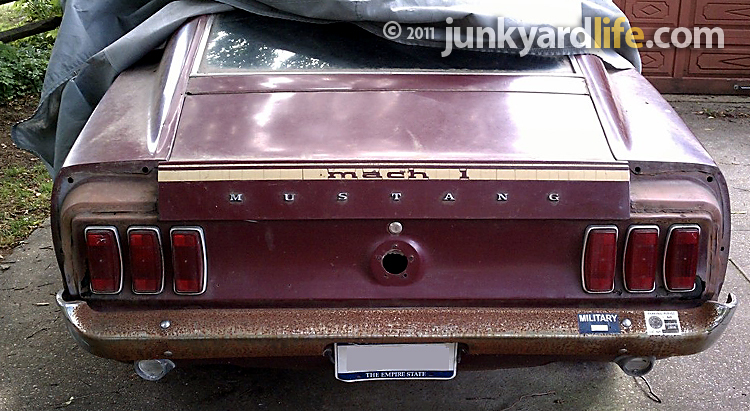 The straight, relatively rust-free body panels finished in Royal Maroon paint with the distinctive Mach 1 striping are striking but Gary was wowed by something stuck to the rear bumper. "What I liked best about this car were the bumper stickers from 1976," said Gary. For 35 years the Mach 1 Mustang has sported a 'Town of Oyster Bay, New York' parking decal. Faded, sticky proof that this Mustang has been locally owned for decades. "I'm shocked at how many of these muscle cars I find neglected on Long Island," said Gary. A 1972 Pontiac GTO and 1969 Chevrolet Camaro have already been spotted on Long Island. Keep cruising for the classics Gary, you might find your dream car. 1971 Ford Mustang Mach 1 in Grabber Lime Green. Mustang II Mach Is were downsized in 1974 and equipped with a 105 hp V6 engine. * Mach 1s were not built on the Fox body platform, 1979-1993. Ford reintroduced the Mach 1 Mustang in 2003. I messed up on your tickets last Saturday. I am VERY sorry! I've tried to call you, but it goes to a fax machine. I'll try to call you again @ 8:00pm tonight. Otherwise, please contact me so I can make it up to you. The tickets have been reprinted and the ones you have are now invalid. The theater will refuse admission if they are presented at the door. Again, my sincere apologies for my screw-up. I tried several times to call you, but was unable to leave a message.